↑ अ आ "History". 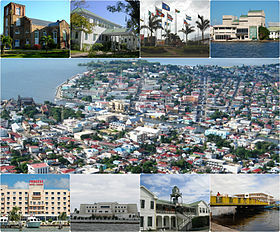 Belize City Council. अभिगमन तिथि July 11, 2014. ↑ अ आ "Population Data – Census 2010". Statistical Institute of Belize. मूल से March 4, 2014 को पुरालेखित. अभिगमन तिथि February 27, 2014. ↑ "belmopanbelize.com". belmopanbelize.com. मूल से July 22, 2010 को पुरालेखित. अभिगमन तिथि June 29, 2010. ↑ "Ambergris Caye, Belize History". अभिगमन तिथि February 23, 2013. ↑ "Ayuso, Mateo, "The Role of the Maya-Mestizo in the Development of Belize", in Belize Ethnicity and Development, papers presented at the First Annual Studies on Belize Conference, May 1987, Society for the Promotion of Education and Research, Belize". अभिगमन तिथि February 23, 2013.